We sell a Poster Display for use in a variety of places including lobbies and retail stores. 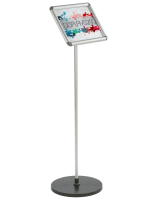 This poster display has a sleek modern design which makes it a timeless addition to your lobby, office, or store. 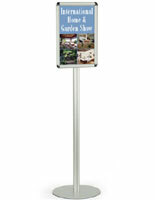 The poster display, also known as a poster rack, is made of satin aluminum. The elegant European design is sure to draw attention. 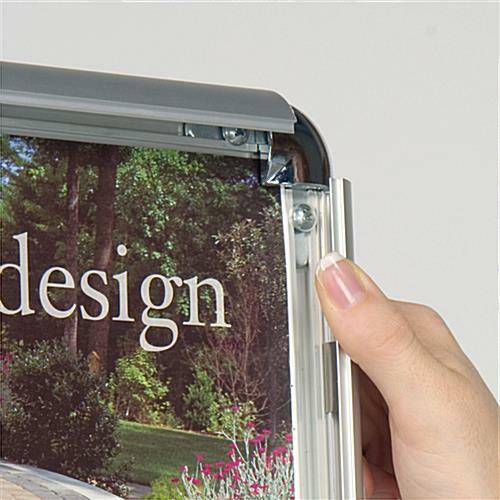 The poster display has a snap frame which opens for easy insertion of your graphic. 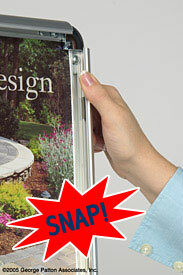 Simply open each side of the poster display, place in the poster and snap shut each side in succession. 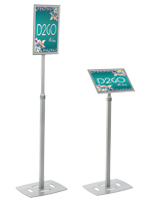 The poster display, like similar sign holders, has 4 rounded chrome-look corners. These corners accent the frame but also provide a safety feature. Squared corners could cause scratches. 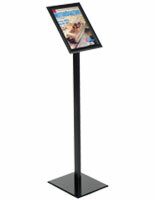 The poster display has a weighted circular base to prevent easy tipping. 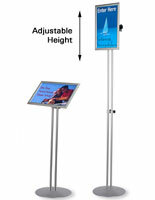 The poster display is a pedestal display that takes up a relatively small footprint.